This post explains how to enable UEFI SecureBoot on Debian, using your own trust chain. The technical part itself is very light, most of the post is explanations and what and why. UEFI SecureBoot is a mechanism to verify a cryptographic signature of UEFI Images before loading them into the Firmware (the new name for the BIOS1). This provides a way to control which images are allowed, and also drivers and option ROM used by the Firmware, and to fight bootkits and malwares based on that. For an example of such dangers, see my past presentations on malicious UEFI Option ROMs ([FR] at SSTIC, and [EN] at PacSec). Roughly, SecureBoot will rely on cryptographic signatures (mainly using SHA-256 and RSA-2048) that are embedded into files using the Authenticode file format. The integrity of the executable is verified by checking the hash, and the authenticity and the trust by checking the signature, based on X.509 certificates, which has to be trusted by the platform. the Platform Key (PK): this is the main key. This keys, usually belonging to the platform owner, controls if the ownership can be changed, or if other keys can be modified. The Key Exchange Key (KEK): these keys control which certificates can be used to sign images. The Authorized Signatures Database (DB): this database contains authorized signing certificates, but also some hashes. Any image, either signed with a certificate enrolled in DB, or having a hash stored in DB, will be allowed to boot. The Forbidden Signature Database (DBX): this database stores forbidden certificates and images hashes. Any Image listed here will never be allowed to run (even if also listed in DB). PK and KEK keys are Certificate Authorities. There can be several KEKs, but they must be signed by the PK. On a typical system, the PK is owned by the manufacturer, as well as one of the KEKs. Another KEK belongs to Microsoft (so the system can boot Windows by default), and that’s it. So, why would you want SecureBoot ? Because it’s a good thing in the general intention (it protects you from malwares), but only if the OEM does grant you the ability to add/change/modify the Certificate Authorities. It improves the trust in the boot sequence, and brings you more control over it. For more details, see the UEFI specifications, and the Linux Foundation Whitepaper about UEFI Secure boot. The sbsigntools and efitools packages are required. Unfortunately, they are not yet in the Debian mainstream distribution. I have created some packages and have submitted them, at the moment of the writing of this post they are currently sitting in NEW. In the meantime, you can use the packages from the openSUSE build system, or build them from the sources. The sbsigntool git tree can be found here, and the efitools git tree is here. For EfiTools, you can also use the UEFI keytool USB image from James Bottomley’s website called sb-usb.img (md5sum 7971231d133e41dd667a184c255b599f). The first case is not described here. It means using shim, which is a bootloader signed by a certificate issued by Microsoft, to chain with your own bootloader. This is mostly useful in case of dual-boot, or when you don’t have your own CA. In my case, the goal sto fully control what can boot or not on my device, and check its integrity, so I will only describe the second case. Obviously, the Firmware must support UEFI and SecureBoot. The Firmware must support Setup Mode, or at least clearing the keys. If it does not, there is no point running your own CA, using shim will be enough, since any executable signed by Microsoft or your OEM will be able to boot2. A PKI, and a way to manage (generate and sign) your X.509 certificates. Note that this is likely to be easier on laptops, because all drivers are embedded in the image. On a desktop, it is probable that external drivers (especially Option ROMs for devices such as graphics card) will need to be signed. First, you need to lock the settings of the Firmware, and make sure that SecureBoot cannot be disabled. To do this, setting a password (at least admin) to the Firmware is required. This part is not covered here. If you have your own Certificate Authority, then you should be able to generate your certificates easily. Copy the keys (the public parts only) to a USB drive, and save the private parts elsewhere (in a safe location). Now, we’ll use the boot certificate key to sign boot images. Note that you don’t really need a bootloader: the kernel image can be compiled as a UEFI Image (CONFIG_EFI_STUB). However, in that case, there is no support for an external initramfs, so you need to embed a pre-built cpio image (using the CONFIG_INITRAMFS_SOURCE option). We now need to sign the bootloader. While this is a simple operation, it will not work as-is with the default Debian installation: Grub, when it detects that SecureBoot is enabled, will refuse to load modules from the disk. There is no support in Grub to support a signature + verification module, so a workaround is to create a Grub executable with all required modules embedded. The content of this file was created by try-and-fail, so you may need to adapt it to your configuration. Note: you will need to sign the Grub executable every time grub is reinstalled (but not when only the configuration is changed). To make things easier to maintain, I also signed a local version of the EDK2 UEFI Shell. This shell will not be present on the boot partition, but it can be useful to keep a USB drive with a bootable shell (for recovery). You can also add a local Grub installation on this key, for example. Remember that SecureBoot will verify signatures of all executables (not only the first). This means that if you use the shell to run other programs, these programs also need to be signed. SecureBoot is not enabled now if you need to reboot to setup the keys. Some Firmwares have menus to add/remove keys (it’s not the case for me). Another solution is to use efitools to configure the keys from the UEFI shell. Add the executables to the USB drive. You will need at least KeyTool.efi, the other executables are not used here. On the next reboot, enable SecureBoot in the Firmware, and then your Firmware should only load signed images, with a trusted certificate. If something goes wrong, reboot and disable SecureBoot. This is only the beginning of the trust chain! 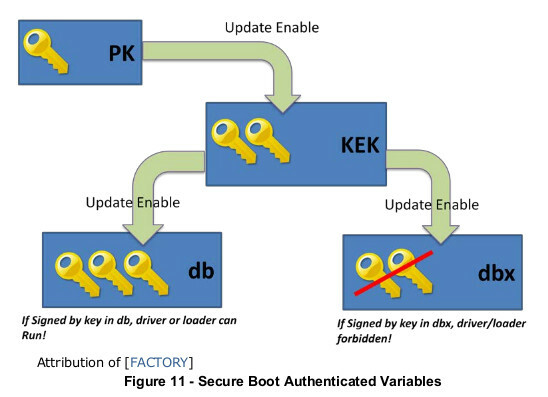 To achieve full boot integrity, all elements from the boot sequence must support integrity checks. For example, if the bootloader does not check the integrity of the kernel image, or the initramfs, then this image could easily be compromised. After the boot, if the kernel does not check the modules it will load, then it could also be compromised. the TPM: The Trusted Platform Module (TPM) is one possible solution: by sealing a key to the values of some measurements, this can tie, for example, the extraction of the disk encryption key to the fact that the expected values were found. This, however, requires a modified bootloader and some additions to the initramfs. I may post something about that in the future. Kernel signed modules: since Linux kernel version 3.7, support has been added for signed kernel modules (CONFIG_MODULE_SIG and CONFIG_MODULE_SIG_FORCE). This allows further hardening of the system by disallowing unsigned kernel modules, or kernel modules signed with the wrong key, to be loaded. See Signed kernel module support for more details.